that they should become charity donors for the first time ever? Their invitation letter cited the importance of this first event at a time of ‘unprecedented opportunities for NGOs in China’. The focus ...was on individual donors, a hitherto neglected group in China’s economic miracle that has catapulted its 1.36 billion people into the world’s no 1 economy with the largest and perhaps most affluent middle class you’ll find anywhere. Shanghai highrises jostling for space in China’s largest city. Modern China is no newcomer to addressing social issues, leading development, tackling poverty reduction or helping those in need. As far back as 1918 Chinese premier Sun Yat Sen was probably the first national leader to advocate for international development in ‘the modern sense of the term’**. Another Chinese premier, Chou Enlai, in 1964 was setting out his eight principles of foreign aid at the same time as Western development agencies were getting their acts together. And China is widely credited in recent years with lifting more people out of severe poverty than all the rest of the world’s aid agencies combined. So it was with trepidation that, as the only non-Chinese name on the programme, I accepted an invitation to speak at the First China Fundraising Conference on 26th July in the National Conference Centre, Beijing. 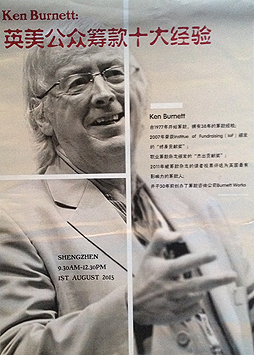 Fundraising is a brand new profession in China. My hosts were the newly formed China Association of Fundraising Professionals (CAFP) backed by four of the largest, most influential Chinese foundations. Their invitation letter cited the importance of this first event at a time of ‘unprecedented opportunities for NGOs in China’. I could hardly refuse. That they flew me and wife Marie out and back business class and offered to treat us right royally throughout aided the decision to go, for sure. But if I’m honest, I’d have paid them, just for the chance. What an opportunity! But, I did ask myself, what can I possibly teach these guys? Well, quite a lot, as it happens. They had invited me because the focus for this first event was on individual donors, a hitherto neglected group in China’s economic miracle that has catapulted its 1.36 billion people into the world’s no 1 economy with the largest and perhaps most affluent middle class you’ll find anywhere. Don’t imagine for a moment there’s anything even slightly primitive about the four gatherings I addressed. These are very sophisticated people in an amazingly hi-tech economic society. Paying delegates at this first conference of its kind topped 170. My subsequent ‘salon’ sessions in Beijing, Shanghai and Shenzhen, which I’d imagined would be regional workshops, turned out to be intimate discussion groups with top leaders from NGOs and government. The Shenzhen audience spilled out the door of our meeting room, and it was held on a Saturday. Three three-hour sessions in three cities in three days takes some doing, especially with tropical rainstorms, cancelled flights and early morning five-hour train journeys. But for sheer audience enthusiasm I wouldn’t have missed any of them for the world. Fledgling though it is, giving in China is already substantial, though most comes from foundations and corporate donors with only a tiny part from individuals. In the UK, individual donors give upwards of 85 per cent of all philanthropy. So the potential for China, both in funds to be raised and for driving social change, is truly enormous. Citing the great Confucius as my mentor I presented my advice as 10 wise insights for China’s emerging fundraising profession, shortcuts they might learn from us. I can only give the briefest summary here of what I told them. Fundraising isn’t about money, it’s about inspiring work that urgently needs doing. People don’t just give to need, they also need to give. Before you receive you must first give yourself. Fundraisers have to build a dream and present it consistently. The most important word of all for fundraisers is ‘you’ (not we, I or us). Showing appreciation is the best fundraising opportunity of all. Fundraisers should become famous for frequent, fast, fabulous feedback (the five Fs). Doing good is good for you and also good for business. Fundraisers should build all their communications around ‘the truth, told well’. In my salon sessions I also put forward 10 tips I would offer to donors, to help them choose the right causes to support. The level of debate these advices stimulated was, frankly, thrilling. 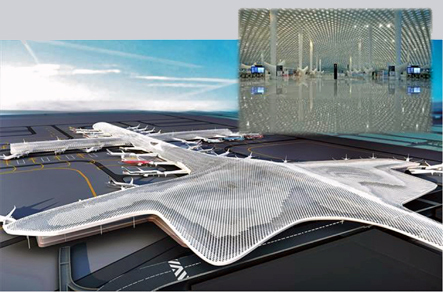 Gazing in awe at Shanghai’s futuristic skyline or at Shenzhen’s massive space age airport it seems easy to believe that China is overtaking the West in substantial ways. Given our at least 50-year head start and the evident disarray that’s all but engulfed UK fundraising right now, it would be truly ironic if the Chinese were also to lead the way in donor-centred relationship development. Of course that’s still a distant dream but after eight days with China’s top fundraisers I’m not just optimistic for their future, I’ll be surprised if they don’t catch us up in a fraction of the time it’s taken us to get where we are. And I expect to see Chinese speakers headlining at Western fundraising conferences really very soon. It won’t be long before you’ll see if I’m right, or not. This article first appeared on the UK Fundraising website. *By 2022, China’s middle class is estimated to reach 630 million – three-quarters of urban Chinese households and 45 per cent of the entire population. The rise of the middle class is essentially an urban phenomenon. ** China’s emergence as a development leader: a historical perspective by Patrick Kilby, July 10, 2015. With thanks to Ying Qiu, guide, translator and moral and practical support to Marie and me throughout our visit to China. And to all her colleagues at Recende and cooperating foundations too. See also Chinese Checkers, how international charities can hasten China’s economic and social development, from The Guardian November 2006. Storytelling can change the world is reviewed here and here. You can buy it here.